The Union Minister for Finance and Corporate Affairs, Shri Arun Jaitley presented the General Budget 2017-18 in Parliament on 1st February, 2017. This is the first of its kind which included the Railway Budget, does not have Plan and Non-plan classifications and has been advanced by a month to the beginning of February. The budget reflects the approach of development of every section of society and every sector of economy. First time in the history of Indian economy, in the budget special attention has been given to rural sector, agriculture, farmers, poor and underprivileged section of society. By reducing existing rate of tax from 10% to 5% on income between 2.5 lakhs to 5 lakhs gives relief to middle class and lower middle class. 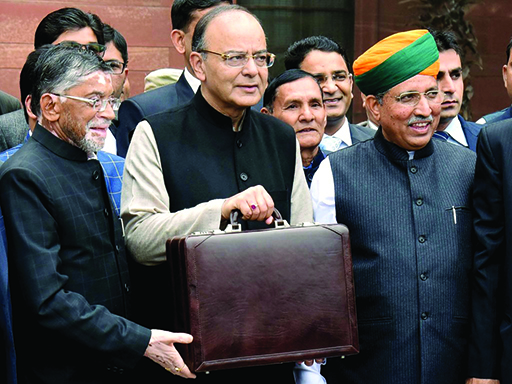 In his Budget speech Shri Jaitley said that the agenda is “Transform, Energise and Clean India” (TEC)- to transform the quality of governance for better quality of life. The aim is to energise various sections of society, especially the youth and the vulnerable and to clean the country from the evils of corruption, black money and non-transparent political funding. He said, the government will spend more in rural areas, on infrastructure and poverty alleviation while maintaining fiscal prudence. Economic reforms will be continued to promote higher investments and accelerate growth for the benefit of the poor and the underprivileged. Total expenditure in Budget for 2017-18 has been placed at Rs.21.47 lakh crores. Here we are publishing the highlights of Union Budget for our reader’s. Swachh Bharat coverage has gone up from 42% in Oct 13 to 60% now. Innovation fund for secondary education. Skill India mission was launched to maximise potential. 100 India International centres across the country. Rs. 39,61,354 crore has been made for infrastructure. SMS-based ‘’clean my coach service’’ is put in place. Proposal to reduce tax for small companies with a turnover of up to Rs 50 crore to 25%.